91-2: Trapping. No person shall trap any wild bird or animal on any property within the corporate boundaries of the City of Glens Falls by use of leg-hold traps, except by duly authorized personnel. 91-3 Dangerous animals at large. It shall be unlawful to permit any dangerous animal or vicious Mina or any kind to run at large within the city. Exhibitions or parades of animals which are ferae naturae in the eyes of the law may be conducted only upon securing a permit from the chief of Police. 91-5: Wild Animals. It shall be unlawful to harbor or keep any animals which are ferae naturae in the eyes of the law anywhere in the city without first obtaining a permit from the Chief of Police. 91-22: Licenses required. A. All dogs in the City of Glens Falls must be licensed with the City Clerk by the age of four months. Owners are required to present a current certificate of rabies vaccination at the time of licensing or the renewal of an existing license. B. All dog licenses will be for a period of one year and will expire at the end of the month one year from the date of issue. 91-23: Dogs in heat. It shall be the duty of the owner or person harboring any female dog to confine such dog during the period when it is in heat inside the house of such owner or person in possession of the dog. 91-24: Running at large. No dog, whether licensed or unlicensed, muzzled or not muzzled, shall be allowed to run at large in any street, sidewalk, lane or public place unless said dog is effectively restrained by a chain or leash, not exceeding six feet in length, affixed to the collar or harness of the dog. 91-25: Defecation on public property. A. It shall be unlawful for any owner of any dog to permit or allow such dog to create a nuisance by defecating on public property within the City of Glens Falls, or the private property of any property owner within the City of Glens Falls, unless such defecation is immediately removed by the dog’s owner. B. It shall be unlawful for any person to keep, harbor or maintain any dog which engages in unduly loud howling or barking habitually or conducts itself in such a manner as to unduly annoy any person other than the owner. 208-30: Snowstorm and emergency no parking regulations. A. 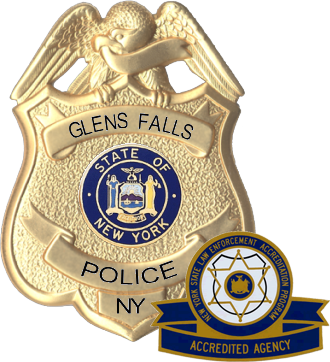 During and after a snowstorm or other public emergency, the Superintendent of Public Works shall have the authority to suspend parking privileges on any street in the City of Glens Falls. The Superintendent of Public Works shall notify the Police Department of the streets to be closed to vehicular traffic, and the Police Department shall thereafter give at least (1) hour’s notice to owners or other persons in charge of parked vehicles to remove said vehicles from the designated streets. B. When any vehicle is abandoned or parked on any street within the city during a snowstorm, flood, fire or any other public emergency which effects that portion of the public street upon which vehicle is parked or abandoned and, after at least one (1) hour’s notice to the owner or other person in charge of said vehicle, said vehicle may be removed pursuant to authorization of the Mayor, or any Councilman, any policeman, Superintendent of Public Works or the Assistant Superintendent of Public Works. C. When any vehicle is found unattended on any street within this city where said vehicle constitutes an obstruction to traffic, said vehicle may be removed, without notice, by any policeman. D. When any vehicle is parked or abandoned on any highway within this city where stopping, standing or parking is prohibited, said vehicle may be removed, without notice, by any policeman. 208-16a: Overnight parking. No person shall park a vehicle on any City street between the hours of 2:00 a.m. and 6:00 a.m. of any day, except for the south side of Lapham Place between Glen Street and the loading dock of the building located at 229 Glen Street. A. Any person violating any of the provisions of this chapter shall be subject to the penalty of $30 for each offense (unless the penalty is specifically noted herein below), and any violation of any of the provisions of this chapter shall constitute disorderly conduct, and the person violating the same shall be a disorderly person. (b) Second offense (occurring within a period of two years): $100. (b) Second offense (occuring within a period of two years): $100. (1) Parking in a no-parking zone, no parking anytime, no parking this side, fire lane, parking less than 15 feet from a hydrant and parking less than 20 feet from a corner $30. D. Any person parking in a designated tow-away zone shall be subject to the penalty of $30 for each offense, together with the cost of towing and storing the vehicle removed from the designated area. A frequent question we get asked, is it illegal for someone other then the home owner to park their car in front of your house? The answer is no. Property owners have no reserved parking spaces in front of their homes. A. While in or on a public street, lane, Roadway, avenue, sidewalk, public parking place, park, playground, recreation area or any other public or quasi-public place or in any public conveyance or upon any land owned or occupied by any federal, state, county or municipal government. B. While in a private motor vehicle while the same is in motion or parked in any public parking lot or other public or quasi-public place. C. While upon any private property, not his own, without permission of the owner or other person having authority to grant such permission. 156-14: It shall be unlawful for any person within the corporate limits of the City of Glens Falls to act as a hawker, peddler, occasional sales person or solicitor, as herein defined, without first obtaining and paid for and having in force a license therefor. 170-19: It shall be unlawful for any person to conduct a garage sale in the City of Glens Falls without first filing with the city Clerk the information hereinafter specified and obtaining from such City Clerk a license so to do, to be known as a “garage sale license”. Current fee for such license is $2.00. 170-20: Such license shall be issued to one(1) person only twice within a twelve-month period, an no such license shall be issued for more than two (2) consecutive days twice a year. Charitable, religious and civic organizations may be allowed more than one (1) license with the approval of the Common Council. 153-6a: No person shall kindle, build, maintain or in any way use a fire except in fireplaces provided or in self supporting barbecue grills or stoves in places designated as picnic areas or by special permit. 153-6b: Any fire shall be continuously under the care and direction of a competent person 18 years of age or older from the time it is kindled until it is extinguished, and no fire shall be built within 10 feet of any tree or building or beneath the branches of any tree or in any under brush. 189-31: The owner, occupant or person in charge of a lot adjoining a city street shall remove the snow from the sidewalks in front of such lot within five (5) hours after each snowstorm and shall keep the sidewalks clear of snow and ice and, when slippery, keep the same safe by sanding or other effective means. A storm ceasing during the night shall be considered as ceasing at 7:00 am the following morning. 189-32: No person shall, in removing snow or ice from a sidewalk or property adjoining a public street, cause the same to be placed in or upon such public street. 14-2a: No person shall ride or propel any play vehicle on any street, highway, sidewalk, public path, parking lot, or within a public building, within the City of Glens Falls central business district more particularly described as the area in the City within the perimeter of the following streets: Ridge Street to Washington Street to Glen Street to Pine Street to Broad Street to School Street to Park Street to Glen Street to the Civic Center Plaza to Church Street to Warren Street to Center Street to Maple Street to Ridge Street. 14-2b1: No person shall use or operate a skateboard, in-line skates, roller skates or other play vehicle upon any public streets (including the entire paved and improved surfaces thereof, including gutter areas, from curb-to-curb, where curbs exist), sidewalks, or on any public lands within the City of Glens Falls: In a careless manner without due caution and circumspection. 14-2b2: No person shall use or operate a skateboard, in-line skates , roller skates or other play vehicle upon any public streets (including the entire paved and improved surfaces thereof, including gutter areas, from curb-to-curb, where curbs exist), sidewalks, or on any public lands within the City of Glens Falls: While endangering, or in any manner to create a risk or danger to, any person or property. 14-2b3: No person shall use or operate a skateboard, in-line skates , roller skates or other play vehicle upon any public streets (including the entire paved and improved surfaces thereof, including gutter areas, from curb-to-curb, where curbs exist), sidewalks, or on any public lands within the City of Glens Falls: in any manner to impede or interfere with pedestrian or vehicular traffic. 14-3b: The parent of any child and the guardian of any ward shall not authorize or knowingly permit such child or ward to violate any of the provisions of this chapter. Garbage – The animal and vegetable waste resulting from the handling, preparation, cooking and consumption of foods and all decayable waste, including animal offal and carcasses of dead animals. Refuse – Dry material produced routinely by household, commercial or industrial establishments, such as papers, cans, bottles and other containers and ashes. Trash – Includes bushes, branches, Christmas trees, lawn raking and similar waste materials; bulky objects, such as discarded household appliances, equipment or furniture; and building demolition and constructions wastes. 121-12a: Containers shall be used for the storage of all garbage, trash, refuse or other waste, pending collection and disposal thereof. Containers shall be provided with a close-fitting cover or with a cover that may be securely latched and shall be rodent proof, insect proof and watertight. Garbage containers and refuse and trash containers shall be of steel construction or some composition of rubber or plastic of sufficient strength to contain said garbage, refuse or trash when filled to capacity. Garbage containers shall not exceed a thirty-gallon capacity nor 50 pounds in weight when filled. 121-12b: Every owner of a dwelling containing three or more dwelling units shall supply sufficient containers for the collection and storage of garbage, refuse, trash or other waste for all occupants of said dwelling. In single or two-family dwellings, it shall be the responsibility of the occupant or occupants thereof to furnish such containers. 121-12c: Except of single and two-family dwellings, while prescribed containers are being stored awaiting collection and disposal of contents, they shall be housed within the closed area of the dwelling or within an enclosed area of an accessory building so that they shall be inaccessible to dogs, rodents, animals and insects. 121-12d: Storage or dumping of trash or refuse in open bins of any kind, either inside or outside of a dwelling or accessory building, is specifically prohibited. 121-12e: In single and two-family dwellings, disposal of refuse, trash, or other waste shall be the responsibility of the occupant or occupants of such dwelling. 121-12f: Where there are three or more dwelling units in the same dwelling, the disposal of refuse, trash or other waste shall be the responsibility of the owner of such dwelling. 121-12g: All garbage shall be removed from the premises by municipal collection once every seven days, except that during the period of April 15 to October 15, the removal shall be effectuated twice in every seven days. 121-12h: All refuse, trash, and waste, other then garbage, shall be removed from the premises at least once every seven days. 121-12i: In the event that the garbage is mixed together with trash, refuse or other waste in the same containers, the contents thereof shall be treated as trash, and it shall be the responsibility of the owner and /or the occupant of the dwelling to remove the same in accordance with the above regulations.